#ParineetiChopra said, it is a matter of great responsibility to take up Behtar India initiative and affect social change. Parineeti Chopra was announced as the brand ambassador of Behtar India Campaign by DHFL Pramerica Life Insurance Company Limited. The unique campaign catalyzing progressive change towards a sustainable India has embarked on its second year. The eight-month long campaign will focus on three main pillars- Health, hygiene, and Environment. 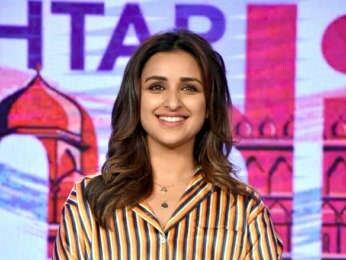 Stressing on using recycled products, Parineeti said, “You will see there is an organic or recyclable alternative to everything. It can be right from a spoon, a glass or a straw to the paper bag in which shopping that we do, everything can be natural but we are just so used to the ease of plastic etc that we don’t want to make an effort but I think you cannot wait for some other person. We have to it because we are the persons living on this planet." The initiative is a contest for schools and students a CSR and an employee engagement window for companies, social service for the individual an amplification tool for the municipal corporations and for the underprivileged children it is an opportunity to receive free health benefits. Last year, the Behtar India campaign reached out to 1100000+ students across 200+ cities and was able to plant 150000 trees. Under the 'Behtar Swasthya' initiative, more than 59000, dengue protection kits were given out to underprivileged students.